Give the children packs of glowsticks (normally around 15-20 for £1) and get them to create necklaces, bracelets etc for them to wear throughout the night. Not only will this be fun to do, but it will also help to light the room up for the rest of the activities. Transform some of your classic parachute games, by turning off the lights and instead lighting the room up with glowsticks. For parachute games which normally involve balls on top of the parachute, replace these with balloons with glow sticks inside. 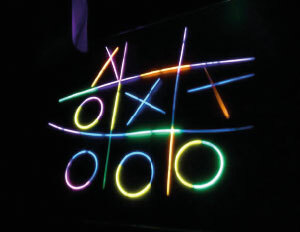 Using thin glowsticks, create a large grid to play noughts and crosses in. You will also need to create 3 small hoops for the noughts and have 3 x 2 lots of glowsticks in order to make the crosses. Give one team the hoops and one team the crosses. Set the grid up at one end of the room and sit your two teams at the other end of the room. One at a time, a member from each team needs to run across the room, place their nought or cross into the grid and run back to their team. Continue to go through the team players until one teams get three noughts or crosses in a row. To make the game harder, place some glow in the dark obstacles between the start line and the game grid. These could be hoops to go through or tunnels to crawl through. For this activity you will need a camera capable of taking slow shutter photos. Give the children a small torch and get them to stand in front of the camera with the torch facing forwards, whilst drawing shapes in the air with their torchlight. 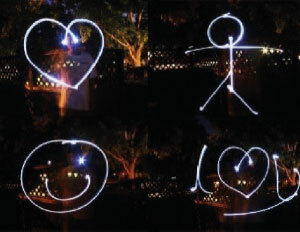 The slow shutter camera should then pick up these shapes and produce pictures as below. Setup a screen so that you can show everyone the end results, if you can print them event better. 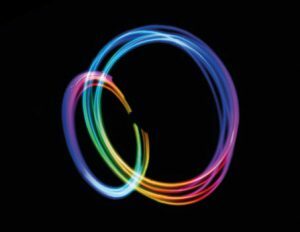 Transform some traditional potted sports challenges with glowsticks and watch the room light up with activity! Bowling: Place glowsticks inside small bottles of water to create 10 pins. With a ball, try and knock over as many as you can. Hoop & Chair: Tape glowsticks onto a large hoop and onto the inside legs of two chairs. From a distance, try and roll the hoop between the gap in the two chairs. Award one point for each successful go. Hoopla: Using a hoopla kit, tape glowsticks onto the target bars and create small hoops out of glowsticks. Throw the hoops onto the bars in order to score points. Obstacles: Set up a small obstacle course, using glow sticks taped onto the obstacles to light it up. Each time the course is completed, a point is awarded to that team. Make up your own: Many of your potted sports challenges can be adapted to a glow in the dark night, just by taping glowsticks to the equipment which you use. Each year Scripture Union create some brilliant devotional resources based on light for their ‘Light Party’ packs. These resources are designed with children in mind and are aimed at bringing the message of Jesus to those who may not have heard it before.